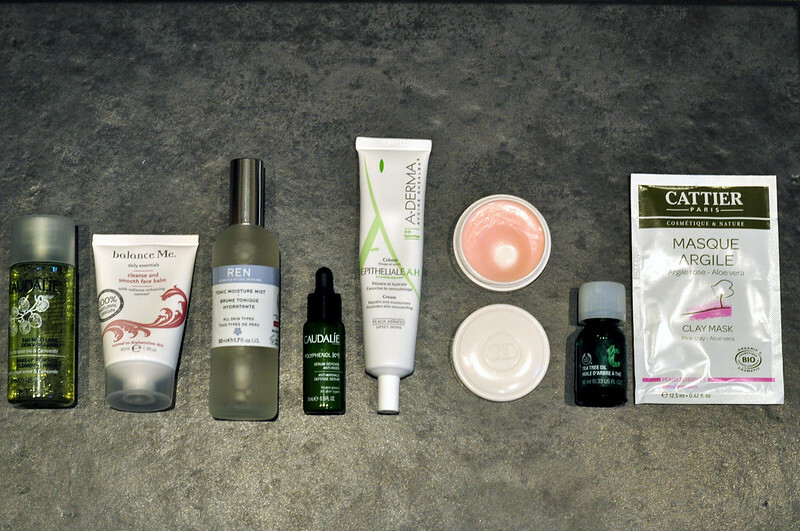 Caudalie Micellar Water // balance Me Cleanse And Smooth Face Balm // REN Tonic Moisture Mist // Caudalie Polyphenol [c15] Anti-Wrinkle Defense Serum // A-derma Epitheliale A.H Cream // The Body Shop Tea Tree Oil // Dior Creme De Rose Lip Balm // Cattier Argile Rose Aloe Vera Clay Mask. This months mix of skin care products are a bit different to what I would have used normally. For two and a half weeks this month I house sat for a family friend and looked after their crazy cat. I decided to make the most of my sample stash and tried to bring mini size versions of everything so I had less to take with me. A few of these I've used before and have already gone through the full sizes. I'd forgotten how much I liked the balance Me Cleanser and REN toner. I've wanted to repurchase the REN toner since I finished my first bottle way back in 2013 but it's always been sold out or unavailable. Luckily I saw it in the Space NK sale in a set with an eye gel and serum. It was only £15 and I was intrigued by the serum. Other than that my skin has been pretty stable which is good. No new eczema flare ups or crazy breakouts.